Before winning the $25,000 Pot-Limit Omaha 8-Handed High Roller, Deeb was in 11th place and was the highest ranked competitor, without a bracelet from this summer. However, the $1.4 million worth victory in the massive $25K event, catapulted Shaun into the top of the podium, with 2,662.25 points. The first cash for the US pro came from Event #4 $1,500 Omaha Hi-lo, where he got 44th for $4,723. He finished 1418th in Event #7 $565 Colossus, a less-spectacular $920. He got 37th in the $2,500 Mixed Triple Draw Lowball for $3,937. He missed the final table by only a couple of places, when he busted in 16th place at the $1,500 NLHE event for $11K but managed to make an even deeper run in the $1,500 No Limit 2-7 Lowball Draw for $36,330. He ended in 965th place in the Millionaire Maker, for $2,345, and 19th in the another $1,500 Limit 2-7 Lowball Draw event for $3,799. 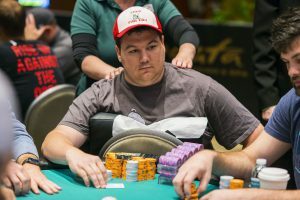 His first (and yet only) six-figure score ($111,447) came in the form of his 10th place prize of the $50,000 Poker Players Championship (which Michael Mizrachi managed to take down for the third time). He also bagged a13th place in the $2,500 Mixed Big Bet event, worth $5,460 before closing the $25K PLO HR for the biggest score of his life, $1,402,683. The ten ITM added a total of $1,583,197 to Deeb’s balance.